Looking for an extreme duty, high-strength and long-lasting durability leather lead? Look no further. 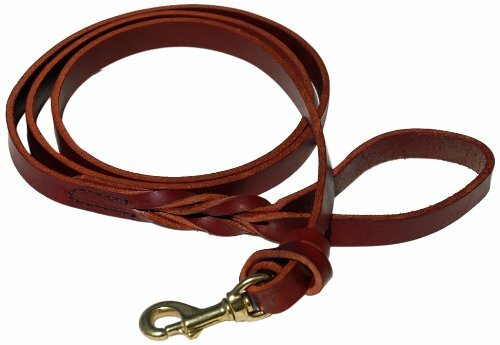 This heavy-duty 5-feet long 7/8-inch wide burgundy latigo leather lead is a full 1/4-inch thick. Hand-crafted, it features extra-strong thread for the stitching and it's double riveted for the confidence you are looking for in a lead. The large 1-inch brass bolt snap also gives you the peace of mind you are using the strongest working dog leash available. The braided handle and reinforced knot at the clasp offers a style not often found in such heavy-duty leads.